I have a good friend named Jen who recently had a baby boy. She was actually at my house the day before she went into labor - this also happened with her second born. Apparently pregnant women need to visit me if they want to have their babies soon.... Anyway, she is a quilter too - so the pressure was on to create something fun and unique for her newest child. No, it's not entirely strips - but it's still a pretty easy pattern to slap together. I used a Robert Kaufman juvenile print entitled: Mixed Menagerie from Pink Light Design by Elissa Hudson- as my focus print. I also used one of my most favorite boy fabrics- Numbers in Citrus from the RK Modern Robin Zingone collection. (Sorry to get all label-y here, but these are two fun fabrics for boys that aren't too nursery or gimmicky- so I figure it would be nice for people to know what they are!). The other fabrics are from my stash. I did a little bit of straight line quilting and a bit of stippling to put the quilt together. I tried spray basting for the first time with this quilt and it went well. 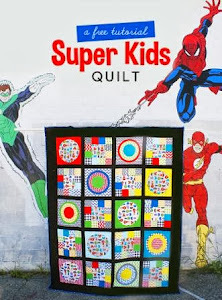 I still have at least two more baby boy quilts I want to make soon and I am not sorry to have them on my "to do" list - it's a lot of fun! Super cute. 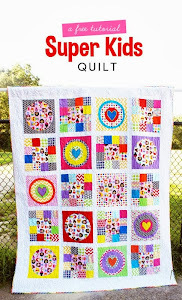 The fabrics work well in this quilt too. Love how your assembled the blocks for farm animals. Love it! Will have to remember this one the next time I have a relatively last-minute baby quilt to make. I always end up drawing a blank when trying to think of something relatively quick to put together, but that doesn't... look to easy, you know? That fabric is adorable! Amen on the sick kids/January blahs. And we didn't even get the "blizzard" in upstate ny that you got. Go figure.